Bet on basketball and win in Hollywoodbets' latest promotion! 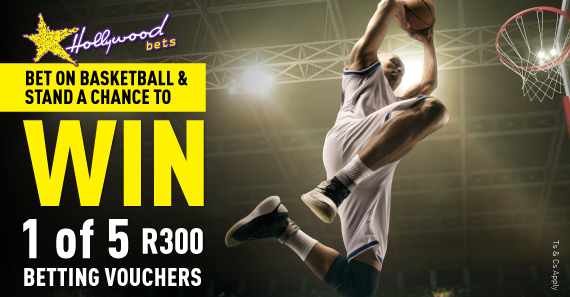 Stand a chance to win yourself one of five R300 Hollywoodbets betting vouchers in our Basketball Promotion! To enter, simply take a bet of any value on basketball (pre-match or Live In-Play) between 16 January – 22 January 2019. The Basketball Promotion runs on all basketball fixtures that take place between 16 January- 22 January 2019. The customer must take a bet on basketball (pre-match or Live In-Play) between 16 January – 22 January 2019. The competition is valid for Hollywoodbets account holders only. No cash bets will be entered into the lucky draw. To enter, a customer must place a bet on basketball on his/her Hollywoodbets account. He/she will be automatically entered. Every bet placed on Basketball thereafter will be counted as an additional entry will be added to the competition. Entries are not limited. Each participant will be entered into a lucky draw which will take place on the 23 January. The prize for the competition includes 1 of 5 of R300 betting vouchers. The Promoter may use, free of charge, any personal data or information, photos or video or audio recordings of the winner of any prize in promotional activities relating to the Promotional Competition, subject to the winner’s right to decline participation in any such promotional activities. This competition is not open to employees of the Hollywood Group and their family members. Hollywoodbets reserves the right not to award prizes should irregular activities be noted. If contestants are unsure of the workings of the competition, they can contact promotions@hollywoodbets.net or our helpline on 087 353 7634. Contestants must be over the age of 18 and have an active Hollywoodbets account. Hollywoodbets has the right to cancel or withdraw this offer or change any of its terms at any time and without cause/notice. Right of participation reserved. Every Hollywoodbets account holder participating in the promotion shall be deemed to have acknowledged and accepted the rules by virtue of their participation.